In 2008, up and coming developer 5th Cell introduced Scribblenauts for the Nintendo DS, a game where you could "Write anything, solve everything". It was an instant hit and spawned a sequel in 2010. It, too, was a success, and this prompted them to create Scribblenauts Unlimited for the Wii U (and 3DS and PC). Is the series' console debut worth the price of admission? 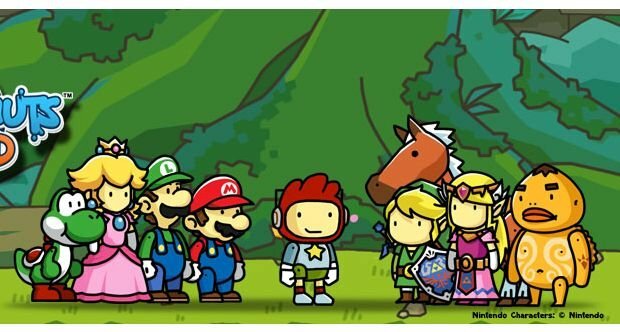 Unlike its predecessors, Scribblenauts Unlimited has a story. Maxwell was given a magic notebook by his parents that makes whatever he writes down come to life. One day, he and his sister Lily came across an old man that was hungry. They played a joke on him and created a rotten apple. The old man was angered by this, and placed a curse on Lily that slowly turns her to stone. The only way to reverse this curse is to retrieve Starites, and Maxwell can get those by helping people. If you aren't familiar with the concept of Scribblenauts, Unlimited is a good game to start with in the series. Talk to people, animals, or sometimes inanimate objects in each stage by clicking on them to get a clue as to what they want. From there, open Maxwell's notebook and type whatever you think they're looking for. Present the object to them (usually just place it near them, but sometimes you have to drag it onto Maxwell first and then give it to them by clicking on them) and see if it satisfies their desires. If not, you can always scrap it and try again. Usually you're rewarded with a Starite Shard for a simple action like this. Ten Starite Shards makes one Starite, and each stage has multiple Shard to collect. Maxwell can also collect whole Starites. In most stages, one or two people, animals, etc. have blue stars floating above them. If you talk to them and accept the task, Maxwell is placed into a set situation within the stage and given a list of specific tasks to tackle. Some of these might include getting a fire station ready to defend against a zombie invasion, recreating the Oregon Trail for a guy that dreams about it, or breaking the curse on a pirate ship. Whatever the case, Maxwell is given a clue. If you're stumped, you'll get two additional clues after some time has passed. Once you get the object correct, you'll advance to the next task. Once all tasks are completed, you'll get a Starite and be one step closer to saving Lily. Maxwell's family photo...that's a lot of kids. At the beginning, Maxwell has a very limited selection of levels where he can travel, but after collecting some Starites, more levels open up. This only happens if you visit Lily after hitting your quota, and the game is good about telling you to go visit Lily. From there, one of Maxwell's 40 siblings shows up and drags him off again, opening up new stages for Maxwell to solve. These stages range from a haunted mansion to outer space, a farm to the city, and a lot of places inbetween. If you ever want to see the whole map, just click the globe icon on the top of the Gamepad. Levels that have no more Starites or Shards left to find have a check mark beside them. Just like in Super Scribblenauts, Maxwell can add adjectives to any noun to make objects more unique. Slow metal Corgi? Sure. Tall skinny house? Go for it. Most of the time, you won't need to use an adjective to solve a puzzle, but some requests require it. Then there's the Object Editor. Tap an item that Maxwell has brought to life, then send it to the Object Editor. You can script a new behavior, scale it, change its color, even add new objects to it. Coyote with a rocket on its back? Sweet! (Maybe he'll finally catch the roadrunner.) You can save these custom objects and share them with friends and others in Punctuation Plaza. Nintendo characters make an appearance in the Wii U version. The game controls great and fully utilizes the Wii U Gamepad. Move Maxwell with the left analog stick, jump with the A button. Movement can also be accomplished by pressing the stylus on the screen if you wish, but I found it more precise with traditional controls. You can also zoom in and out with the ZL and ZR, or move the camera around the screen with the D-Pad. If you lose Maxwell, just tap on his icon on the top of the screen and the camera will move back to him. The game looks great in HD, but the problem is you will rarely be looking at your TV when playing because you'll be too busy typing on the touch screen. It looks good enough on Gamepad as well, so nothing is lost there. Animations are fluid, and the Scribblenauts art-style was faithfully recreated for the big screen. The Wii U version even did away with the budget meter (which limited how many objects Maxwell could create) because it had extra horsepower. The game features full off-TV play as well. From a sound perspective, Unlimited also does a good job. Objects make the type of sounds you would expect them to make, and the typical babbling sounds that people make are good enough. The only voice acting was in the beginning and end, where Maxwell's sister Lily, voiced by Jennifer Hale, narrated the story, and that sounded good. The music in Unlimited is fitting in each area, though when the game was switching tracks, it would often go silent for short periods. As fun as Scribblenauts Unlimited is, the puzzles aren't nearly as challenging as previous entries. Most of the Starite Shards require easy answers that don't make use of adjectives. Despite that, thinking creatively to solve a puzzle can be very satisfying. You can amass Maxwell's brothers during your quest to cure Lily, and once you help them out, you can swap them in as your avatar at any time. Scribblenauts Unlimited is a good game. I downloaded it from the Wii U eShop (less than 2 GB) on Christmas day and enjoyed my time with it. However, I feel like it should have been priced a bit lower. At $40, this would have been a much easier sell. The added features make this worth checking out. It took me ten hours to complete the story, and there's still plenty left to do. I recommend jumping in with an open mind. Imagine anything, explore everything! You can write them in whenever, but you can't edit their behaviors or add adjectives to them (except the color of Yoshi, from what I gather). Mario automatically runs to Yoshi whenever he's written in too. Nice review Lewis! It sounds like everything I expected from the game, and I'll be glad to play this soon as my first Scribblenauts game (picked it up recently during Target's B2G1F sale). I was soured by the original game due its crap controls, but I may give this a go if the price is right. I also like that it's easier, the original required such obscure solutions. By the way, the Nintendo characters are exclusive to the Wii U version. Edited the review to reflect that. Good review! How is the sharing community on Wii U? Active? And did you try the crazy multiplayer? $60 was definitely a lot to swallow. Especially since it was way cheaper (and still rapidly discounted) on PC. The sharing community is pretty active (at least it was when I fiddled around with it), and using Miiverse is also a blast. I didn't get to try multiplayer. Yeah, I'd say wait for a price drop on this. If it were $40 at launch, that would have been a much easier sell. At $60, it's a bit dry. She needs you to protect her!